The first interstellar object ever seen in our solar system, named 'Oumuamua, is giving scientists a fresh perspective on the development of planetary systems. A new study by a team including astrophysicists at NASA's Goddard Space Flight Center in Greenbelt, Maryland, calculated how this visitor from outside our solar system fits into what we know about how planets, asteroids and comets form. On Oct. 19, 2017, astronomers working with the NASA-funded Panoramic Survey Telescope and Rapid Response System (Pan-STARRS1) at the University of Hawaii spotted an object zipping through our solar system at a very high speed. 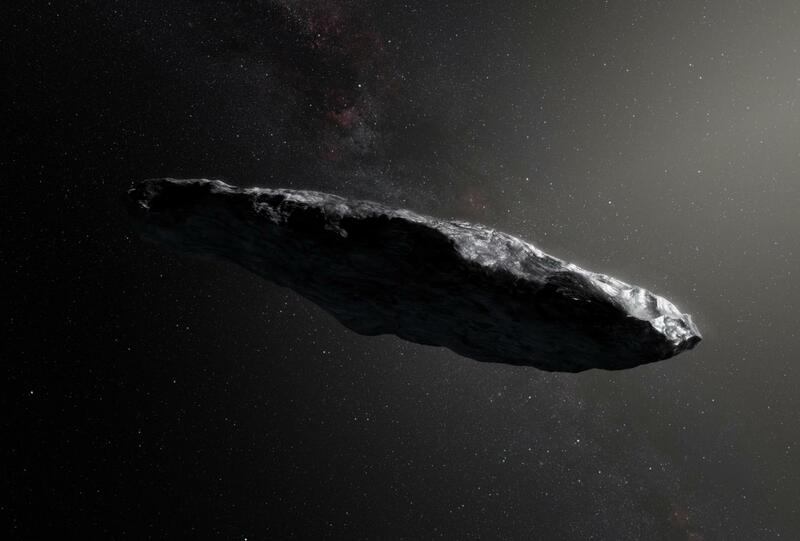 Scientists at the Minor Planet Center, funded by NASA's Near-Earth Object Observations Program, confirmed it was the first object of interstellar origin that we've seen. The team dubbed it 'Oumuamua (pronounced oh-MOO-ah-MOO-ah), which means "a messenger from afar arriving first" in Hawaiian — and it's already living up to its name. "This object was likely ejected from a distant star system," said Elisa Quintana, an astrophysicist at Goddard. "What's interesting is that just this one object flying by so quickly can help us constrain some of our planet formation models." On Sept. 19, 'Oumuamua sped past the Sun at about 196,000 mph (315,400 km/h), fast enough to escape the Sun's gravitational pull and break free of the solar system, never to return. Usually, an object traveling at a similar speed would be a comet falling sunward from the outer solar system. Comets are icy objects that range between house-sized to many miles across. But they usually shed gas and dust as they approach the Sun and warm up. 'Oumuamua didn't. Some scientists interpreted this to mean that 'Oumuamua was a dry asteroid. "The total real estate that's hot enough for that is almost zero," said lead author Sean Raymond, an astrophysicist at the French National Center for Scientific Research and the University of Bordeaux. "It's these tiny little circular regions around stars. It's harder for that stuff to get ejected because it's more gravitationally bound to the star. It's hard to imagine how 'Oumuamua could have gotten kicked out of its system if it started off as an asteroid." The distance from a star beyond which water stays ice, even if it's exposed to sunlight, is called the snow line or ice line. In our own solar system, for example, objects that developed within three times the distance between the Sun and Earth would have been so hot that they lost all their water. That snow line contracted a little as the Sun shrank and cooled over time, but our main belt asteroids are located within or near our snow line — close enough to the Sun that it would be difficult to be ejected. "If we understand planet formation correctly, ejected material like 'Oumuamua should be predominantly icy," said Thomas Barclay, an astrophysicist at Goddard and the University of Maryland, Baltimore County. "If we see populations of these objects that are predominantly rocky, it tells us we've got something wrong in our models." Using simulations from previous research, Raymond and colleagues showed that a small percentage of objects get so close to gas giants as they're ejected that they should be torn into pieces. The researchers believe the strong gravitational stretching that occurs in these scenarios could explain 'Oumuamua's long, thin cigar-like shape. The researchers calculated the number of interstellar objects we should see, based on estimates that a star system likely ejects a couple of Earth-masses of material during planet formation. They estimated that a few large planetesimals will hold most of that mass but will be outnumbered by smaller fragments like 'Oumuamua. The results were published March 27 in the journal Monthly Notices of the Royal Astronomical Society. The findings have already been partially confirmed by observations of the object's color. Other studies have also noted that star systems like our own would be more likely to eject comets than asteroids. Future observatories like the National Science Foundation-funded Large Synoptic Survey Telescope could help scientists spot more of these objects and improve our statistical understanding of planet and planetesimal formation — even beyond our solar system. "Even though this object was flying through our solar system, it does have implications for extrasolar planets and finding other Earths," Quintana said.